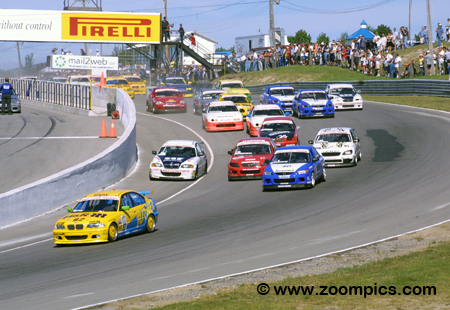 The Speed World Challenge Touring Cars were making their second 2002 visit to Mosport International Raceway – their first stop was on the Canadian long weekend in May. Drivers would compete on the ten-turn 2.459-mile former Grand Prix circuit for fifty-minutes. 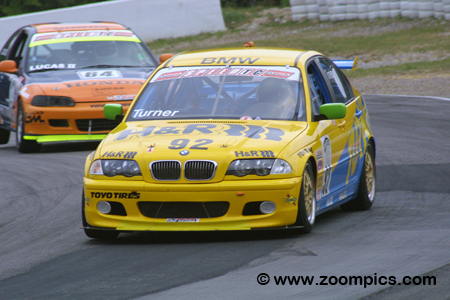 The pole-sitter for round eight of the 2002 Speed World Challenge series was Will Turner who beat the field of the thirty-four starters to Mosport International Raceway’s first corner. Behind Turner, and barely holding on to second place is the other front row starter, Paul Bonaccorsi in the No. 40 Mazda Protege ES. 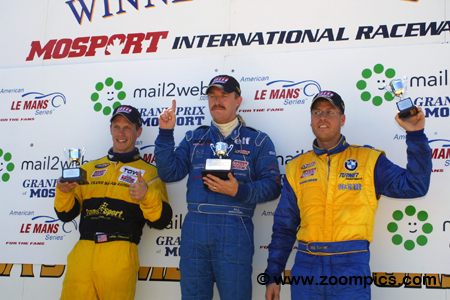 Challenging Bonaccorsi for the position is the BMW of the winner in May, Ken Dobson and Chuck Hemmingson in a Mazda. The No. 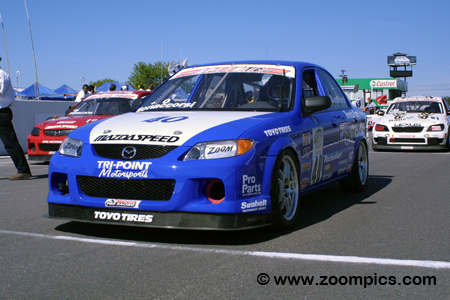 40 Mazda Protege was raced by Paul Bonaccorsi. 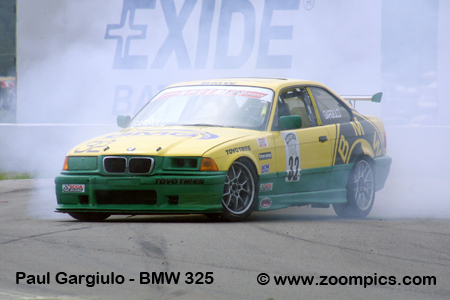 Bonaccorsi won his first race of the season at Road America. At Mosport, he showed some speed in practice but stepped up his game in qualifying and started on the outside of the front row. Bonaccorsi followed the leader, Will Turner until lap-6 when Turner made a mistake at Moss Corner. He grabbed the lead and despite pressure from Turner, he scored his second victory of 2002. The second practice session was conducted on a drying track. 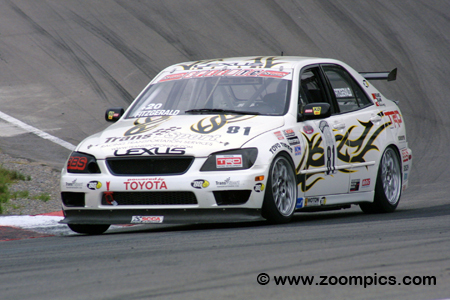 Quickest of the group that participated was Mike Fitzgerald in the Team FBR Lexus IS300. Fitzgerald finished third in the two previous rounds – Washington and Trois-Rivieres. 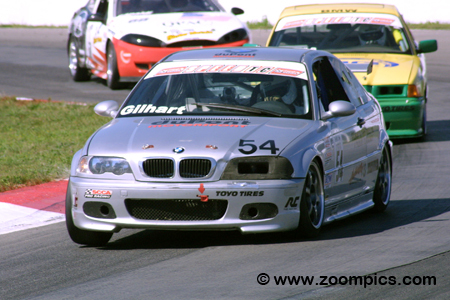 At the second Mosport race, he started fourth and chased the leaders, Paul Bonaccorsi and Will Turner. On the final lap, Fitzgerald beat Turner in a drag race to the checked and earned the runner-up spot. Will Turner was having a productive year. In round four at Mid-Ohio, he scored his first victory since 1999. At the second Mosport event, Turner qualified on the pole. During the race, he led the first five-laps but on the sixth circuit, he went wide at Moss Corner. This allowed Paul Bonaccorsi to draft past on the Mario Andretti Straight. Turner attempted to pass Bonaccorsi on the final lap but lost the position to Mike Fitzgerald. Chuck Hemmingson entered the Mosport weekend fresh off his victory two-weeks earlier at Trois-Rivieres. Hemmingson was driving the No. 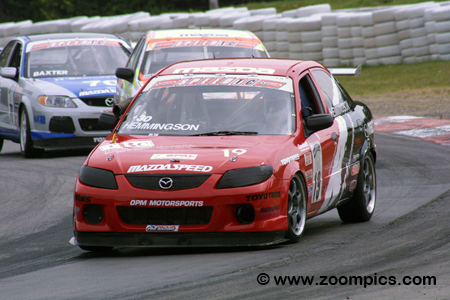 19 OPM Motorsports Mazda Protege ES with backing from Mazda and Crocotile. He was quick in practice and qualified third for the fifty-minute contest. On lap-12 of the race, Hemmingson lost third place to Mike Fitzgerald. He remained in fourth place until the end of the event. 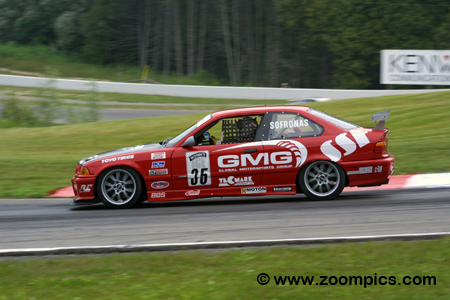 Ken Dobson captured his first series victory at Mosport earlier in the season. Driving the SSF Imported Auto Parts BMW 325Ci, Dobson showed he was still ‘on form’ by turning the fastest time for both practice sessions. In qualifying, his performance slipped and Dobson was fifth quickest. For the most part, Dobson had an uneventful race and finished in the same position as he started. Gridded twenty-fifth for the start of the race was Rick Gilhart driving the No. 54 BMW 325Ci prepared by DuPont Motorsports. On the opening lap of the contest, Gilhart passed the most competitors (three) which earned him the B&M Hole Shot Award. He made good progress during the race (passing as many as two cars per lap) and at the checkered flag, Gilhart was in twelfth place. In 2002, James Sofronas was competing in the series on a part-time basis. To date, he had entered the first race at Mosport International Raceway, Mid-Ohio Sports Car Course and Road America. At Road America, Sofronas qualified second but fell off the pace and finished second. During qualifying for round eight at Mosport, he was sixth quickest. Able to maintain his position, Sofronas finished in the sixth spot. 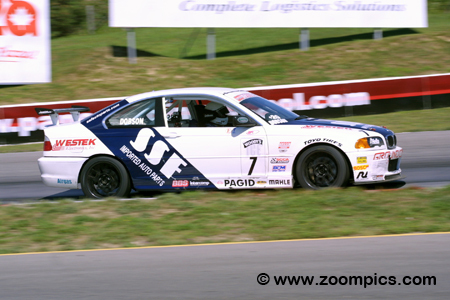 The Speed World Challenge Touring Car podium for round eight at Mosport International Raceway. To the left from Team Franz Blam Racing is the runner-up, Mike Fitzgerald who posted his best result of the season. In the center of the rostrum is the winner for the second time this year, Paul Bonaccorsi. Completing the podium is Turner Motorsport’s team principal, Will Turner.